It is scientifically proved that although our skin starts ageing at 25, the effects become visible only at 40-45. The slowdown of cell production and the decrease in the moisturizing rate kept so far by the connective tissue entail a weaker resistance to external aggressions. One of the major factors responsible for early skin ageing is the development of free radicals. Because of their high reactivity, they harm skin cells causing oxidative damages, which accelerate the degeneration of elastic fibers. Many are the possible causes of free radicals development; nonetheless, the most common is UV radiations. 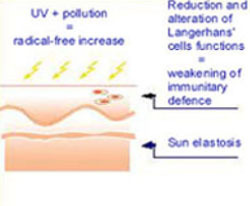 UV radiations are responsible for the decrease in the number and functionality of Langerhans cells, i.e., the main components of Skin Immune System. Beyond the exposure to sun, many other environmental factors concur in producing extremely huge quantities of free radical, such as environmental pollution, smoke, chemicals, emotional and physical stress, etc. A certain quantity is even produced by our organism itself (what we could define as “physiological” free radicals). Since it is impossible both to stop time and to eliminate polluting agents in the atmosphere, what we can do is to slow down skin degenerative action by protecting skin at the right time through the integration of substances whose natural composition is similar to our skin. Skin degenerative action caused by environmental and atmospheric polluting agents. The distorted cell functionally entails early skin ageing, with the consequent appearance of wrinkles, fading and skin thickening. Because it acts as a physiologic regulator, skin plays a crucial role in the general water metabolis of our organism. This is why the hydration of skin horny layer apt to maintain epidermis resilient and undamaged is of strategic importance. The presence of substances aimed at retaining water in the horny layers allows it to check its own water content when directly exposed to the external environment. Furthermore, the horny layer can protect skin from external temperature, regulate the deepest water layers, neutralize acids and alkalis, and act as a barrier against foreign objects and microrganisms penetration, thanks to the keratin contained in the horny cells and in presence of the right level of hydration. A lack of hydration in the horny layer may reduce its resilience, which leads to a visibly dryer and rougher skin. • failure in the physiologic balance of horny layer moisture level, which may drop towards dehydration. Increasing skin hydration through higly moisturizing substances helps avoiding small wrinkles due to dehydration. • HYDRACORAIL® Moisturizing, Remineralizing Body Cream, After bath. Our skin is composed of many elements including epidermis and dermis. While the former fulfils a protective function for the whole body, the latter acts as a support to epidermis and it is responsible for skin tonicity. Dermis compact structure is due to the presence of collagen and resilien fibers, whose loss is one of the main causes of ageing. Wrinkles and slack tissues are the main signs of face ageing. Ageing, though, follow no precise pattern, as it is an extremely subjective process, influenced by muscles, tissues, skin, hormones and our personal lifestyle. Thus, wrinkles are the result of a combination of internal and external factors. 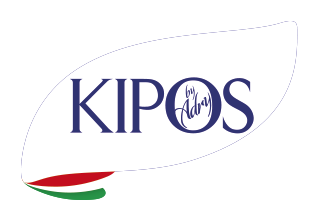 • Internal factors are connected to the ordinary ageing process of our tissues dermis slackness, face muscle hypotonicity and reduced hydration. • External factors can have a negative influence on the skin, excessive sunbathing, exposure to heat, chemicals, smog and so on, speed up the wrinkle induced ageing. Some habits can help us protect our skin and ease ageing effects: the correct use of creams containing anti-oxidant and moisturizing agents such as Vitamins A and E, Jaluronic acid, Ceramides, etc. Stretch marks are linear scar injuries caused by skin stretching with subsequent rupture of elastic fibers. In the early stage, stretch marks are red, just to fade to pinck and then to white once they normalize. Stretch marks are a flaw usually found on thighs, buttocks, hips, calves, abdomen and breasts, which entails an alteration of the normal skin surface with transversal, diagonal, fanlike and horizontal trend. • particularly fast growth during puberty. As a preventive measure, it can be useful to apply moisturizing creams rich in Proteins, Vitamins and moisturizing and resiliency boosting substances targeting the horny layer and its firmness. •ANTI-STRETCH MARKS* Firming Body Cream. • Edematous stage : edematous adipose tissue, i.e., liquid in excess above all in ankles, calves, thighs and arm. • Fibrous stage : formation of a fibrosis, i.e. volume increase in the connective tissue, which harden the adipose layer. It is characterized by small cutaneous nodules and orange peel effect on the skin. • Sclerotic stage : formation of a sclerosis, resulting in gradual tissue hardening with the formation of big, very sore nodules. The appearance of cellulite depends on several factors, genetic proneness, higher genetic sensitivity, incorrect lifestyle, coffee and alcohol abuse, smoking, physical and psychological fatigue, bad eating habits. A substantial aid in cellulite fighting, namely in its early stages, can come from specific creams containing drainage ingredients, such as Fucus, Escin, Caffeine and substances stimulating and protecting microcirculation like Ginkgo biloba, Bitter orange, Seaweeds, Sweet clover, etc.